If you perform your ablutions you wash yourself, usually as part of a religious ceremony. Decrepitude is the state of being very old, worn out, or very ill; something or someone is no longer in good physical condition or good health. A genteel person is well-mannered, has good taste, and is very polite in social situations; a genteel person is often from an upper-class background. If you do something with panache, you do it in a way that shows great skill, style, and confidence. If you have good sartorial taste you know what to wear to your best advantage, or you have the skills of a tailor. If you say someone’s behavior is unseemly you disapprove of it because it is not in good taste or not suitable for a particular situation. If you behave in an urbane way, you are behaving in a polite, refined, and civilized fashion in social situations. The young gentleman looks dapper, well-groomed, and neat in his new, striped suit. He walks along the sidewalk in a crisp and dapper manner, with a lively spring in his step. All the young ladies admire his dapper and stylish appearance, thinking to themselves that such a sharply dressed man must be on his way to do something very important or fun. Quiz: Try again! What does it mean to be dapper? To be seen as an important figure admired by many. To be seen as attractive and handsome. To be seen as dressed well and very neat in appearance. 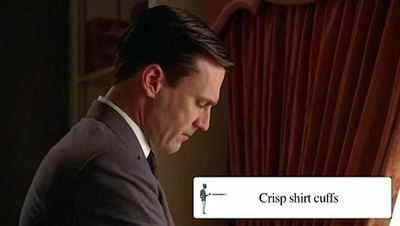 Dapper Dan In the film O Brother Where Art Thou, Ulysses used Dapper Dan on his hair which made him look quite smashing and dapper. YouTube: Henry Herbert Tailors These men are dapper!